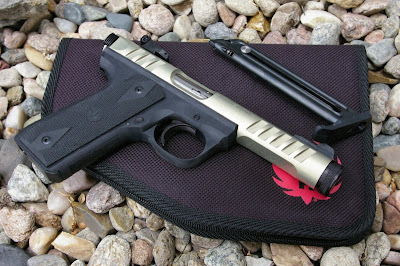 I am probably the last writer on earth to review the Ruger 22/45 Lite Rimfire .22 pistol, however I wanted to take a bit more time with this pistol to really understand the benefits beyond "its newer and lighter." The progressive refinement of the Ruger Mark I, II, and III line of .22 semi-automatic pistols have been staples of the Ruger portfolio since their introduction and without question the most popular .22LR semi-auto pistols in history. A few years ago, Ruger answered the requests for a 1911 style grip with the 22/45 models featuring a restyled polymer lower receiver modeled after the 1911 all married to the tried and true Mark III upper receiver. In later 2012, Ruger again offered a few new options to the 22/45 line including a few tactical threaded barrel models and this ultralight aluminum sleeved and tensioned barrel "Lite" model for the lightest 22/45 ever. Ruger is one of my favorite production manufacturers of all time simply because their products work and all brutally tough. I already have a few Mark II/III versions but previous have never really warmed up to the 1911 style grip. The promise of Ruger's new Lite model had me intrigued enough to pick one of the early releases up from my gun dealer. As will all initial vs current production in the Ruger line, the initial limited edition golden anodized finished model pictured here has now become a standard black anodized finish which if I am honest, I tend to like the black finish a bit better after seeing it at the 2013 Shot Show. From a fit and finish perspective, the 22/45 Lite features the same high quality as any other Ruger 22/45 models with the exception that it features an aluminum sleeved and tensioned barrel with a stainless steel liner. This is where the feel comes into play. 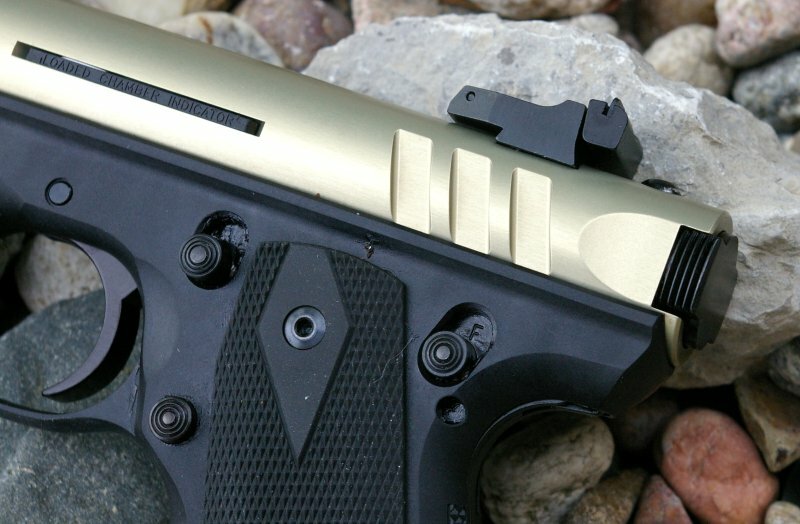 The pistol is light, freaky light which may for some shooters be too light. The 22.45 Lite is 23oz vs the 43 ounces of an equivalent Mark III with steel barrel and steel receivers; definitely a huge weight savings. I certainly have a number of lightweight aluminum sleeved barrels for 10/22s, however in this 22/45 format the feel is more of a toy than mentally what you expect the 22/45 Lite to weight. 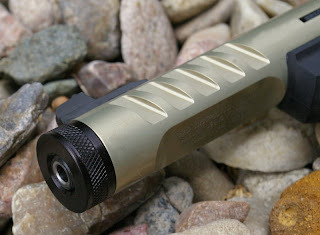 On the other hand this extraordinary light weight makes for a perfect gun to throw in your pack or carry all day long. 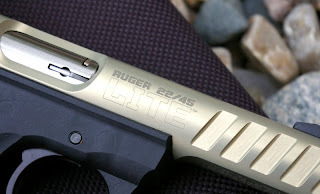 Like the rest of the Ruger 22/45 line, the Lite model accepts the 22/45 magazines, but not the standard Mark II/III magazines without modification to the bottom of the grip. I may show this grip modification with another Ruger 22/45 I now own. As you would guess, the magazine bodies and feed angles are the same, it is just the base plates on the magazines that are different between the 22/45 and Mark III models. As you would expect, sharing the same upper as the Mark III models, the 22/45 Lite model's controls are all in the familiar positions as the updated Mark III models but feel more positionally correct due to the 22/45 lower receiver. In fact you could swap out a Mark III lower with the new 22/45 Lite upper. The main attraction of the 22/45 Lite is the lightweight aluminum sleeved barrel with a threaded muzzle. Everyone has been screaming for factory threaded muzzle models from Ruger to attach suppressors and muzzle brakes so Ruger assured standard 1/2"x28 threads tipped the muzzle all protected by a spring washer and knurled thread protector. The 4" barrel was selected due to customer demand simply because a 4" pistol barrel is considered optimal to assure even high velocity .22LR rounds remain subsonic which in turn means potentially less noise with or without the addition of a suppressor. The 4" barrel has also been especially popular with hunters who want a smaller more compact trail gun for all day carry. 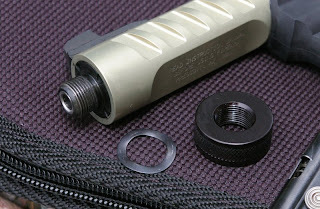 The barrel itself is similar to Tactical Solutions PacLite barrel line. 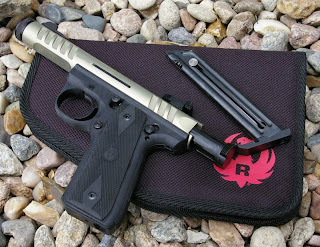 Ruger decided it was time it offered its version with a tensioned stainless barrel liner and aluminum outer sleeve and upper receiver. In theory a tensioned barrel will deliver higher accuracy and the aluminum sleeve will aid in heat dissipation to further increase accuracy. Of note, the Lite's barrel is pre-tensioned and non-adjustable, so you cannot "tune" the barrel yourself. Tensioned barrels basically apply tension or lightly stretch the barrel at each end of the barrel to increase barrel strength, reduce harmonics, and in the end increase accuracy. Although the barrel angled serrations are cool looking and drop a tiny little bit of weight, they are confusing mentally. You head tells you those are cocking serrations and no matter how many times embarrassment sets in when we attempted to charge the pistol, the grip feel and look of those serrations tell your head you can charge the gun with them. I laughed at my buddy after he did it, they he laughed at me... this cool feature gave both of us quite a laugh during testing. The 22/45 Lite comes packaged with two magazines and lock and features target adjustable sights, 1911 style grip panels, and thumb actuated magazine release. On my first two Mark III pistols, originally I loathed the chamber indicator which only seemed to deliver jams, double feeds, and failures to eject, however based on my testing I believe Ruger has worked through these problems from the initial first generation Mark III release. Any now I jump on my soap box. 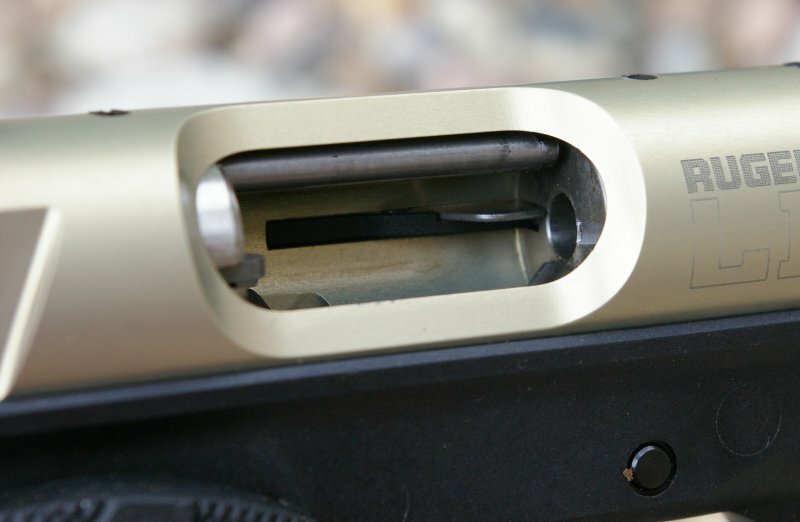 The magazine safety now standard on every Mark III and 22/45 including this Lite model has to be the single dumbest idea on the planet. The original conceptual theory was designed for law enforcement who like to carry a round in the chamber and could protect them from being shot with their own gun if the magazine release was hit during the gun take away. Personally I don't buy it. If you have that much dexterity in a hand to hand fight tumbling on the ground then you should have control of you gun. Mag releases are hard enough to hit perfectly under regular stress with out a ton of practice. If you are that much of an idiot to disregard every other imaginable safety precaution then you should not be handling guns. If anything, I believe guns with a bunch of extra automatic safeties breeds complacency and in the end causes unsafe situations because people just assume the gun is automatically safe. The other main issue for me is that if I have a gun that will not fire if the magazine is ajar or missing, it becomes a gun which may not deliver at least one round when I need it to simply because the magazine button has been accidentally pressed. Yes, this occurred while testing and made me miss a perfectly good shot on a destructive varmint that had every right to die. Unfortunately the varmint was far quicker than my tap and rack. For this reason, I have actually removed this safety on my other Mark III pistols. Search Youtube, there are a number of videos which show this relatively simple process step by step. One of the easiest ways to remove the safety is to just install a Volquartsen Mark II hammer which effectively removed the safety disconnect. Rants aside the magazine safety is not a deal killer because it is easily enough removed, however I think it is a dumb idea in the first place. Generally Ruger .22 semi auto pistols all require a fair amount of break in before they start humming along; generally a couple thousand rounds. I was surprised and pleased with the 22/45 Lite that we only had a couple issues in the first 500 rounds of Winchester M-22 and 555 bulk ammo. 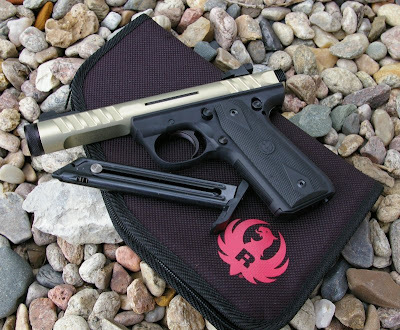 After than it zipped along like any of my other Ruger rimfire pistols. From an accuracy perspective the Ruger 22/45 seemed to be about the same as any of my other Mark III pistols and not substantially more or less accurate. The pistol powered with my Winchester 555 and M-22 ammo delivered regular 1" groups at 25-yards off of sand bags with open sights. This is very good accuracy from my perspective which is plenty accurate for a pistol with this intent. Comparatively my Ruger Mark III pistols carry 5.5" and 6.7" slab-sided target barrel, so similar open sight accuracy from a 4" barrel version of the same gun seemed pretty impressive. Generally with less weight comes less offhand shooting stability and this was the case with the Lite model. Shots I could make with my heavy models weighting in at twice the weight were far easier than with the Lite model. There is a trade off for weight and off-hand stability is the trade. Unlike the Tactical Solutions upper barrel unit, the Ruger Lite model does not have a match or enhanced match chamber which means although similar looking to the Tac Sol PakLite barrel, it will not deliver the same 1/2" at 25 yard accuracy. I have personally shot a few of the PacLite equipped Ruger Mark III pistols and they can indeed deliver substantially better accuracy that what I was able to produce with this 22/45 Lite model. 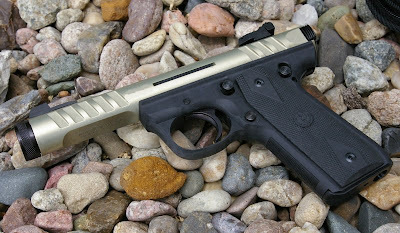 All that noted, keep in mind that you would have about $200-$300 more invested in a pistol with the Tactical Solution upgrade than with the factory Lite model which I am not sure is worth is for a trail pistol or just for a host pistol for a suppressor. The magazine safety aside, the Ruger 22/45 does deliver everything we as consumers asked Ruger to deliver. A super light 22/45 1911 grip style format which allows us to do some low cost practice with a 1911 analog in cheap to shoot .22LR caliber. 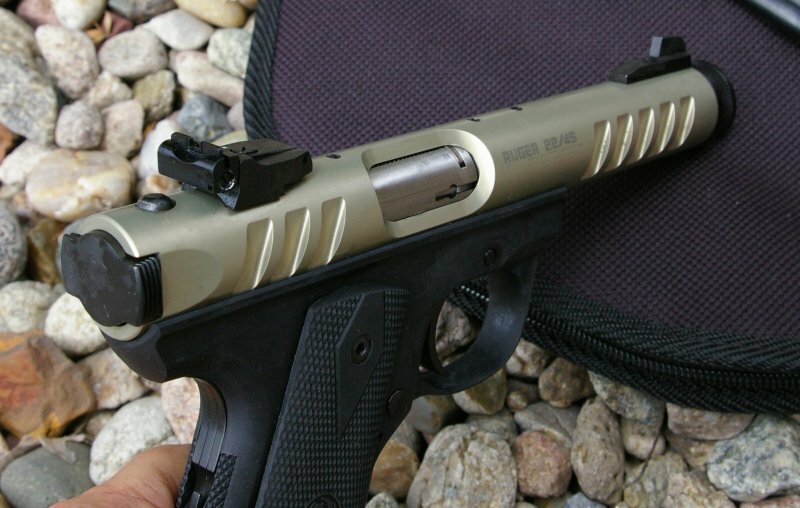 Ruger added a lightweight threaded barrel and all for a street price around $450. A get little piece of kit that it a great option over going the custom route.